Dr. Opitz is known to his friends and family as Nick. He is a graduate of Loyola University and earned his doctorate of optometry from the Illinois College of Optometry. Nick completed his residency at the Hampton VA Medical Center. He holds the rank of Associate Professor at the Illinois College of Optometry. He continues to educate future optometrists and lectures frequently for continuing education programs both nationally and internationally. ​Nick is an accomplished researcher and has had many publications highlighting his contributions to the profession of optometry and eye care. He is a member of the Illinois Optometric Association, the American Optometric Association, and is a fellow of the American Academy of Optometry. ﻿Nick was born in Chicago's Norwood Park. He and his wife, Sarah, currently live in Norwood Park with their three children in the ﻿same house he lived in as a small child. Nick is Chicago sports enthusiast and a die-hard Cub fan. He enjoys family time with his kids, golfing and biking. Sarah's interest in eye care began in First Grade when she was prescribed her first pair of glasses. She began working for her local optometrist during high school and went on to earn her Associate of Applied Science from Triton College. She completed the Ophthalmic Technician program with honors and has more than 15 years experience in the eye care field. 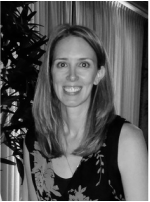 Sarah has worked in private practice as well as at the University of Illinois at Chicago in the Eye and Ear Infirmary. Her training and passion for all things eye inspired her to help develop Norwood Park Eye Center. She is looking forward to sharing her expert knowledge with the people of Norwood Park and other nearby Chicago neighborhoods. Sarah has been married to Nick since 2007, together they have three children. She enjoys cooking, reading, and spending time with her family.